On September 4, 2009 a project, led by Wolfger Pöhlmann (Goethe Institute Athens) in cooperation with eleven other South Eastern European Goethe Institutes, started which revives the idea of social sculpture by Joseph Beuys and his concept of direct democracy. Along with Joseph Beuys' extended concept of art, the OMNIBUS for direct democracy will arrive in Munich this week packed with new impetus after two months of touring through South Eastern Europe. To conclude the Democracy in Motion-tour, a reception and art performance by Johannes Stüttgen, master-class student and companion of Joseph Beuys, will take place at the Akademie der Bildenden Künste in Munich on Saturday, November 14, 2009 at 4 pm. On its 8,000 kilometers long journey, the OMNIBUS visited twelve countries and 21 cities under the guiding theme of Democracy in Motion. With the intention of combining art and politics and agreeing with locals on a self-determined society according to Beuys' concept, the OMNIBUS will finally return to Germany after stops in Slovenia, Croatia, Bosnia and Herzegovina, Bulgaria, Macedonia, Greece, Turkey, Romania, Serbia, Hungary, Slovakia and Austria. 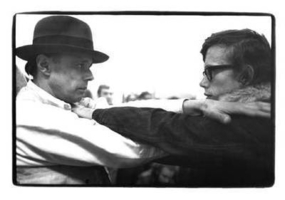 In 1971 Joseph Beuys founded the Organization for Democracy by Popular Vote along with Johannes Stüttgen. With this organization Beuys found an equivalent to his utopian concept of a society as social sculpture, on which the OMNIBUS team's approach is based upon. 'The OMNIBUS works with Beuys' concept of social sculpture, which is rooted in the idea that everybody should take a responsible part in creating a society according to their own special abilities' states Michael von der Lohe, managing director of the OMNIBUS. The tour draws to a close in Munich where the OMNIBUS will reach its final destination at the Akademie der Bildenden Künste on November 14, 2009. We would be pleased to welcome you at the Akademie der Bildenden Künste in Munich.